Millerntor-Stadion, 3. Februar. Auf den Transparenten steht (auf Griechisch): “SOLIDARITÄT” und „HÄNDE WEG VON DEN BESETZTEN HÄUSERN“. 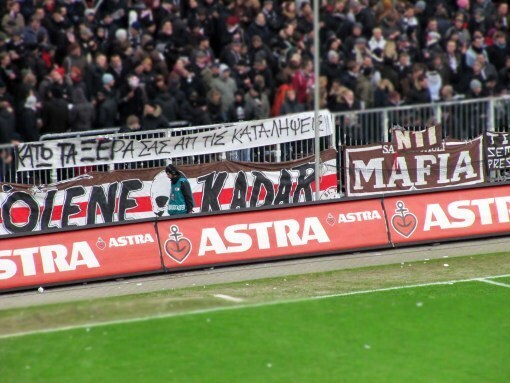 St. Pauli fans sent us photos from a football match on the 3rd of February in the Millerntor-Stadion. 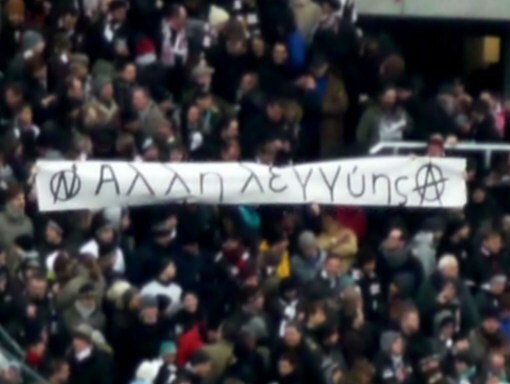 The banners read (in Greek): “SOLIDARITY” and “HANDS OFF THE SQUATS”. A photo reportage of the game between the teams of Sankt Pauli and Energie Cottbus is available here, in German. This entry was posted in Black February, Direct Action and tagged Germany, Hamburg. Bookmark the permalink.